There is something truly immersing about these 360° panorama. Whether it is an urban landscape or the great outdoors, a big panorama really puts the viewer in the middle. I started experimenting with panoramas using the Canon 7D with Sigma's 4.5mm f/2.8 Circular Fisheye lens. This lens captures a full 180° view in a complete circle - ceiling to floor, wall to wall. Such an ultra-wide view eliminates the needs to capture and align rows of images. All you need is one pass around in a circle. This Sigma lens makes it simple! 1. Taking the pictures with a good tripod. There are several companies that sell "panorama" tripod heads. But, all you really need is a tripod head with bubble levels (both horizontal and vertical) and degree markers. The tripod must be as perfectly level as possible so that when you pan around your camera will stay level. I have also read about people getting buy with as little as 6 photos. That may be fine for a small web image. But, if you want a super-sharp, super-large image, you will need to take more photos. The exact number will depend on the sharpness of the lens and the markers on the tripod head. I found that taking RAW photos in 15° increments, duplicating the starting point as your last image works best. This means 24 images plus one image for the ceiling and the floor patches. 2. 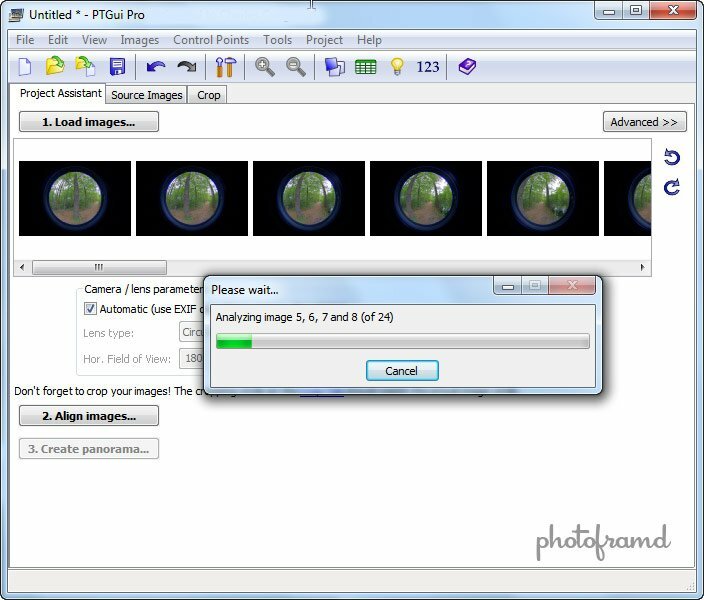 Loading images into PTGui Pro. There are several programs that claim to create 360° panoramas. I used the same test images in both Easypano Panoweaver and Jumpeye JCPanoramaEditor. The results from both were lacking. Then, I found PTGui. This is a great program! It handles a variety of image types including a true circular fisheye like Sigma's 4.5mm lens. It will import and process the Canon 7D Raw files directly. The Pro version is even 64-bit and will even link and process HDR image groups. If you use Raw files, it will pull the lens and exposure info from the EXIF data. Once PTGui has assembled the images, you can preview the panorama. From this pop-up window, you can change the panorama mode from sphere to other setting including "Little Worlds"! 5. Output the panorama as a Photoshop file. 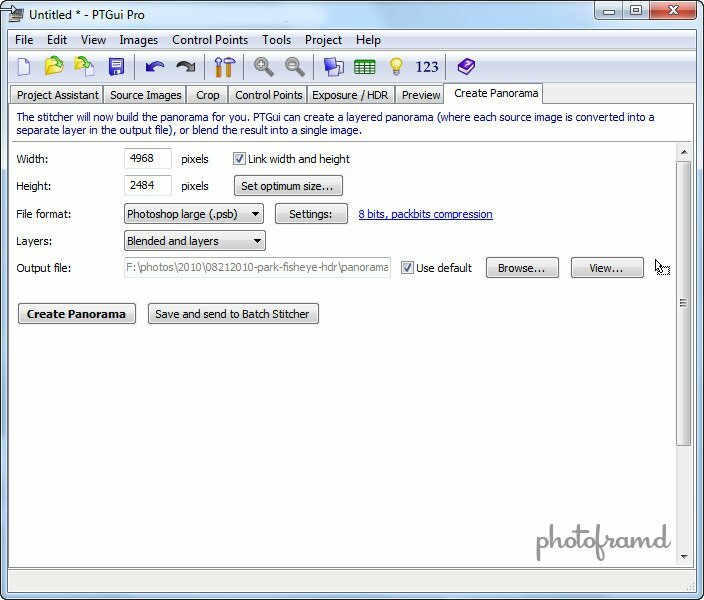 You can output the panorama as a single flat file. However, the better way is to output the panorama as separate layers with masks in one BIG photoshop file. 6. 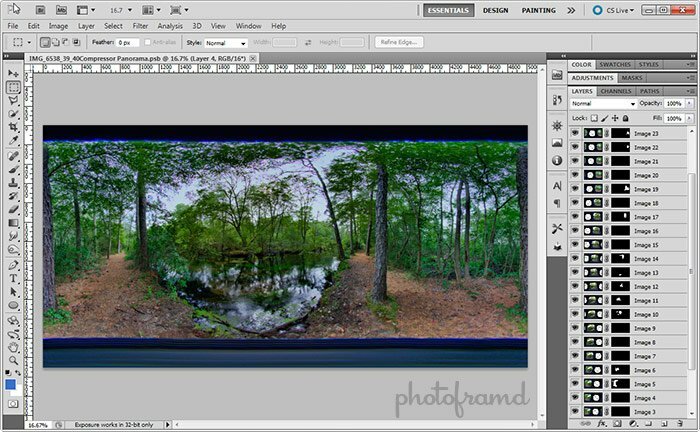 Fixing the Panorama in Photoshop. Now for the time consuming part! If you only need a web image, you can get by with the output file. However, if you want the sharpest image possible which can be viewed full screen, you will need to fix this file. Look closely for ghost inconsistencies. There will be quite a few. Also, look for areas that are soft. Chances are the real photo is sharp and PTGui over blended and unfortunately softened the images. 7. Final output composite as a JPG. With the composite fixed, save the image from Photoshop as a JPG. PTGui can create Quicktime VR panoramas. 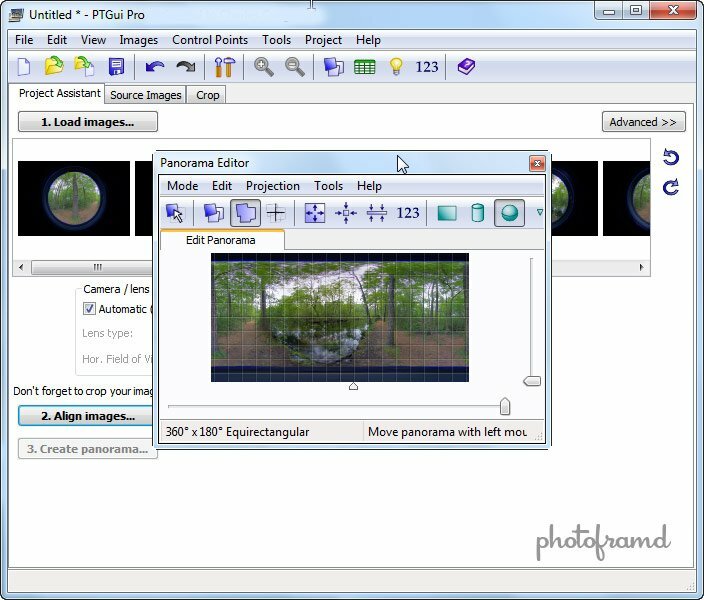 But, if you are interested in creating a web-compatible 360° panorama, you are better off using a Flash generator like Garden Nome's Pano2VR or Flashifactor. I have been using Pano2VR which makes creating blend "patches" very easy. Once you start creating 360° panoramas, it gets very addictive. As you can guess, I already have quite a few in the can, so expect to see many more here! Just a warning about doing panoramas when there are things in the scene that are up close and far away. If you don’t use a pano head and rotate around the camera nodal point then you will get issues to varying degrees. I also mostly just use a normal tripod head and it works most of the time. But if you make one of those artsy photos with something like a fence running past you and off into the distance you will probably have some issues with the stitch. A lot depends on the zoom setting of the lens (50mm etc. ), the scene and the software for stitching. But yes, most of the time just a tripod will work. Also, you can get away with only 20% overlap if you use a lens that is sharp out to the edges like in the range of 24-50mm. How do you like the ballhead for panoramas? So far I have stuck with older, crappier tripods to avoid the ballhead because I was wondering how that would be to set up for taking pictures around in a circle. The Sigma 4.5mm Circular Fisheye lens works very well for these 360-degree panoramas. Not only is it sharp f/2.8, but it captures a very wide 180-degree view in one photo. Combine these photos together and your patch area will be very small. An easy area for Photoshop CS5’s Content-Aware Fill to repair. As for overlap, I like the 15-degree increments. It is probably the most prominent markers on your tripod head which makes it very quick to follow. In an active area, it is very important to get in and do your series before the lighting changes or some distraction moves it. People love to stare as I am shooting a series, so it is better to record more natural behavior than someone looking directly into the camera. I grabbed one of these because it was all the $$$ I could justify. But it works surprisingly well. And, it is very light. But, it does take a few minutes to set up so maybe only good for landscape shots and not “people might stare” shots. But it really does work. If you do get one, be sure to use a cable release. This is because this pano head is not super sturdy/super vibration dampening so it needs the isolation that a cable release provides. Fun toy, I mean tool. It only supports 3.2 pounds! I’m considering this lens for capturing HDR light domes for lighting and reflections in CG. This is where you would just take one bracketed shot straight up, and transform this into the top half of a Long/Lat panorama for import into the 3D application. One question: why did you need as many as 24 images to do the stitch. Is the resolution really low toward the edges? Too much aberration? The Stream View 360-panorama was actually from an HDR series I shot with 3-exposures for each of the 24 increments. I tried using PTGui to pull it together and it assembled the image correctly. However, I found that Photomatix pulled more detail from the exposures, so I ran the images through Photomatrix first and then assembled the composite in PTGui. Overall, I think the Sigma 4.5mmf/2.8 is a great lens. Take a look at my review of the Sigma 4.5mm f/2.8 lens. I have several unedited photos on this page. The lens is very sharp. It is also very unique. It is the only f/2.8 circular fisheye for a crop sensor. Even the just announce Canon 8-15mm L is an f/4 and it is not a circular fisheye for crop sensors. Instead, on the 7D/60D/Rebel, it stretches the image to fill the entire sensor. As I said in the article, shooting at 15-degree increments makes it easy and fast. I did try shooting in larger increments, but ended-up loosing track. With some practice, I can knock out a series in about 2-minutes. Using a panorama head like Nodal Ninja might make this process simpler. You can use less photos with PTGui. My original test was with 8 photos and that was hand-held (using the Canon 7D and the Sigma 4.5mm lens), spinning around in a chair. It worked well. But, if you want the sharpest composite possible, exporting to a Photoshop file with layers is a must. 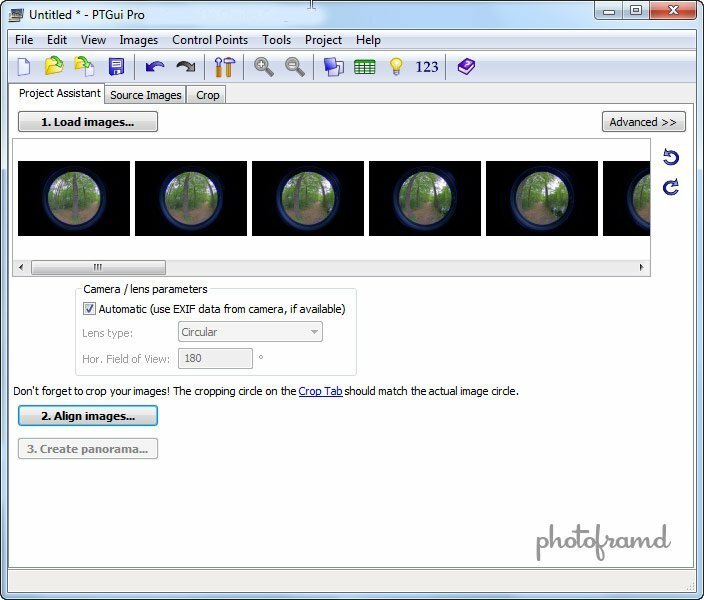 PTGui will remove the distortion from the images and place each photo on its own layer, aligning the features in each photo. You can then go through the layers looking for the best details to include. Exactly my reason! Panorama heads are big and expensive. It is much easier to use a good tripod head and just keep track of the increments yourself. I also have some video shot with the Sigma 4.5mm on the review page. I should have used a lower ISO but you can clearly see the distortion effect. Interesting tutorial. I just want to let you know my experience. I use a Nodal Ninja II Mk3 pan head together with a Rebel XSi and Sigma 18-200mm DC OS lens. This setup gives me very satisfactory results. Stiching is done with PTGui. Right now, I am testing a Sigma 10-20mm DC. So I strongly recommend Nodal Ninja for its ease of use and finally its attractive low price. Wonderful gallery of panoramas! I would love to know how many photos you typically use. The great thing about the Sigma 4.5mm lens is its sharp 180-degree view. I use only one-row of images in PTGui. The patch area is very small. I could see the Nodal Ninja being necessary if I was to patch together multiple rows of images. But, that would put me into the bigger Nodal Ninja 5 head (which apparently was just discontinued) or the Ultimate head (which is smaller and I assume lighter). These heads add the precision of off-axis rotation. 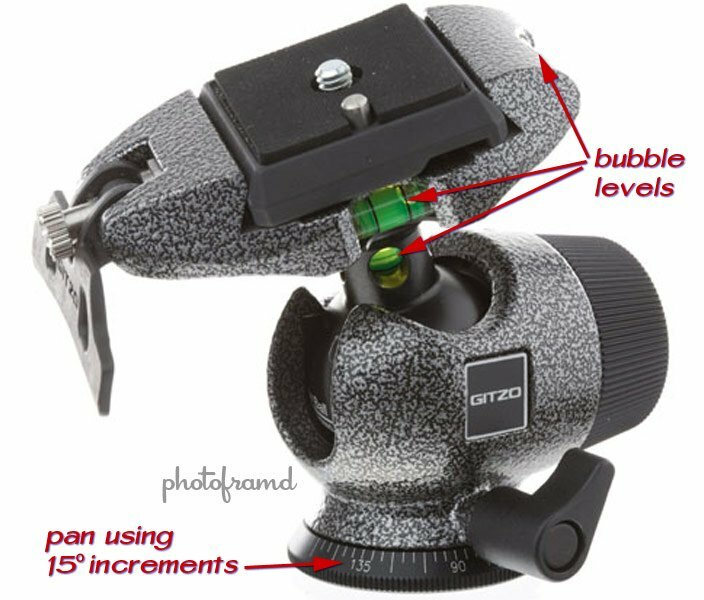 Honestly, the combination of the Sigma 4.5mm and my regular Gitzo GH1780QR ball head works perfectly. Its compact, light-weight and supports up to 18-pounds. I just need to level off the bubbles and I am ready to go. I can shoot a 24-photo series in under 2-minutes with the Canon 7D. With the gear described above, I normally take 32 pictures for a full pano i.e. 3 rows of 10 + nadir & zenith. I agree, this is lots of pictures and it also takes a long time to shoot. But the final result is panos up to 22000 x 11000 pixels. This provides quite a high definition when you zoom from within the pano viewer. One would have to trade off between the resolution, the shooting time and the weight of the files not forgetting the post processing work. This is why I am testing a 10mm zoom now. I have done only one pano with it to check the alignment of the head. The next step will be to experiment with the number of rows and the total number of picture for the final configuration. I thought once acquiring a fish eye lens 8 or 10 mm but I finaly opted for the high resolution capabilities. BTW, I will receive a Canon 7D tomorrow, I am so excited about starting panos with it. Thanks for the update. I have been using the default settings in PTGui to create images 5560 x 2780 @ 300dpi. That’s enough resolution for a 18.5″ x 9″ print. Not sure if it will assemble larger images using the fisheye. But, I am able to shoot 24 images in under 2 minutes. Very important for trying to capture a “moment” with people in action. Please let me know how you like the 7D! THANK YOU! All this is very helpful. I have been shooting panoramas for years. I have two Follmer Graflex #10 Cirkut Cameras in perfect condition. They are in storage for the moment. Just a few short years ago Kodak was still making boxed film for the #6 #10…don’t recall if they then had film for the #14/#16. I restored these cameras and used them both. From there, I went to a 2 2/4″ Noblex. Fantastic lens. Two exposures rotated create a one-stitch (no Photoshop program) to easily give a high quality 360 +. Along with this wonderfuly engineered image device I also used the the Fuji Panorama camera. It worked very well but required Photoshop Stitching (easier than ever..now!). If you look at my website…the Ocean Spray Cranberry pano was shot on the Folmer-Graflex #10. The film negative was 8 feet long, very sharp! At the time, there was no technology to scan the negative, I had to carefully razor cut it in 3 sections to fit the available scanner! The Halekulani Hotel shot was the Noblex. The Iolani Palace Main Hall interior used a 20mm vertical lens on my Kodak/Nikon. Shot and stitched around 18 exposures, then, on PhotoShop Cs3…the best stitiching program at the time. The Cs3 beat out around 6 other stitching programs I have since….deleted! Wow … digital makes live sooo much easier! The Sigma 4.5mm Fisheye is a great lens. I use it for all of my 360 panoramas. Adorama stocks the lens for all mounts including Canon, Nikon, Sigma, Sony, Pentax for $899 with FREE Shipping. They even have a few used lenses in various mounts. As for the tripod and head, you can use any tripod as long as you are careful and consistent. I have even shot several 360 panoramas hand-held!